Disney, you either love them or hate them. The majority of kids love them, of course and so do many adults, whether they want to admit to embracing their inner child or not. So you’d think that Disney would have come up with a game featuring all their franchises sooner, but it took the toy/game hybrid idea of Skylanders for them to see where this would work. 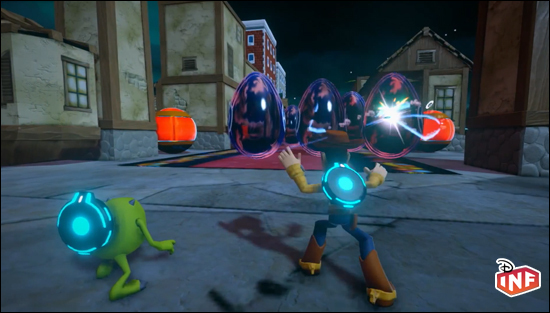 While it’s true that Disney have borrowed the idea of the portal and toy combination from Skylanders lock, stock and barrel, the similarities end there. Where Skylanders is a pretty linear game, where the rules are laid out at the start and you know pretty much what to expect throughout the game, no matter what character you use, Disney Infinity provides a very broad template which can stretch from race track to platform game to a high seas battle. So Its true to say that Infinity’s flexibility is its greatest strength and, occasionally, its weakness, but I’ll get on to that later. All you need to know is that the game is split into Playsets, which are predefined areas based on one franchise, and the Toy Box, which is a mishmash of everything. Now the level of the enjoyment you’ll get from Infinity will be directly proportional to your love of the characters. It’s either a clever move by Disney, then, or simply good marketing, that they’ve managed to bundle 2 Pixar sets and Pirates of the Caribbean with the initial package. Monsters Inc should be an easy sell, The Incredibles less so, but on playing their world you can see why this made sense. While it seems that Disney have ignored all their classic franchises, what they’ve chosen here really does help to showcase 3 very different styles of game and, with Monsters University in cinemas, a world already familiar to kids. The three characters (Sully, Mr Incredible and Captain Jack) are packaged together with a clear plastic model which triggers their worlds. Other packs, like the cars package, have different models to open brand new worlds and game styles. What you get here is a free-roaming city adventure with Mr Incredible, a scare-based game set in Monsters University which involves some basic stealth tactics and plenty of frat style tasks and, lastly, a pirate adventure that lets you take the high seas as Captain Jack and look for treasure while trying to defeat Davy Jones. The games deliberately keep these franchises separate from each other, no playing with Mr Incredible on a pirate boat here, which allows them to properly focus on the look and feel of that franchise. These three worlds highlight the diversity of the game engine perfectly and the final piece of the puzzle is Toy Box mode. 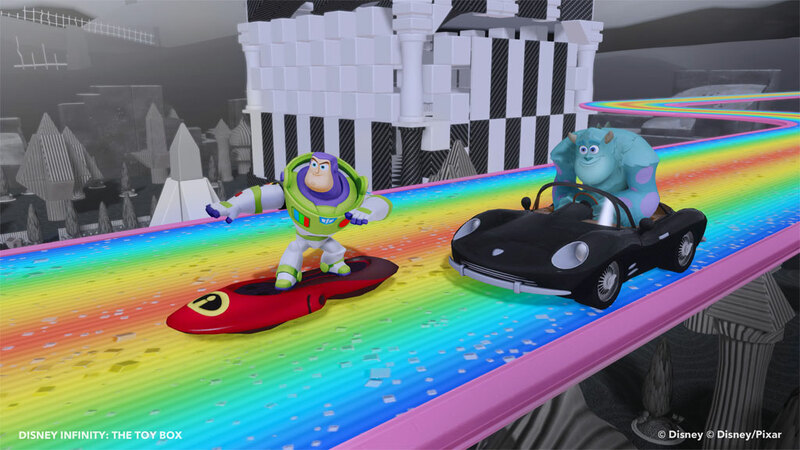 Taking some inspiration from the rather good Toy Story 3 console game, as well as Little Big Planet, Toy Box mode gives you a set of toys, tracks and scenery and sends you off to create something fun. Thankfully, the building tools are easy to use, including start and finish lines, triggers, activation switches and simple logic tools to set events in motion. The ability to share toy box creations with others and the included sets help to get you up to speed with the task, too. Whether younger players can get to grips with this world building tool is another question, but adults will certainly have fun here, even if they’re creating something for the kids (or for their inner kid). What it also does is to finally let you mix and match your characters in its game world. New toys can be earned in the individual worlds or through spins on the one-arm-bandit style device which sits on the central hub. Any new toy is immediately available in the Toy Box and this gradual unlocking helps to add some longevity to the game, beyond the release of new characters and playsets that Disney already has planned. Coming back to what doesn’t work, Infinity is not a perfect game. An in-game engine that can conjure such diverse worlds and play styles is also one that becomes a jack of all trades and master of none. Look closely and you’ll find cracks in the game. There’s also a lack of solid progress in your (expensive) characters as levelling up becomes just a means to a gold statue in the halls of heroes and a progress bar of gold stars. The initial package only allows for single player games in playsets. Any multi-player element outside of the Toy Box mode requires the purchase of another character from that world. For the child, or the inner-child playing, however, the magic of having these characters together in a world and having this diverse range of games to play counters these small issue easily. Time will tell if further playsets will be able to take the playsets into further directions or whether they’ll just turn into carbon copies of the current playsets. 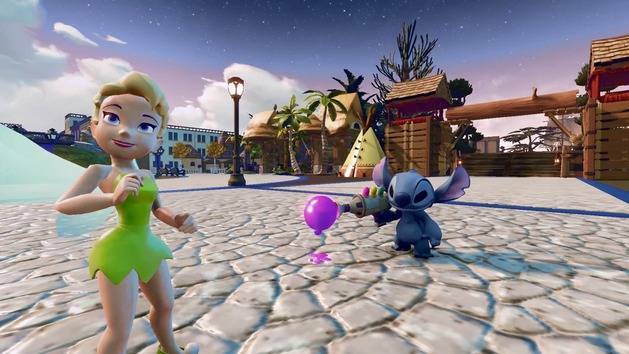 However, for now it represents something of a dream title for Disney fans of all ages, particularly families, and plenty of gameplay to keep everyone busy for a long time to come.